Wood changes the character of a room. You can create a sense of energy or of calm, depending on the species and cut you choose. Grain matching across cabinets is a standard option on all slab-style Grain Collection doors. Bold and sophisticated, this door is destined to be a timeless classic. 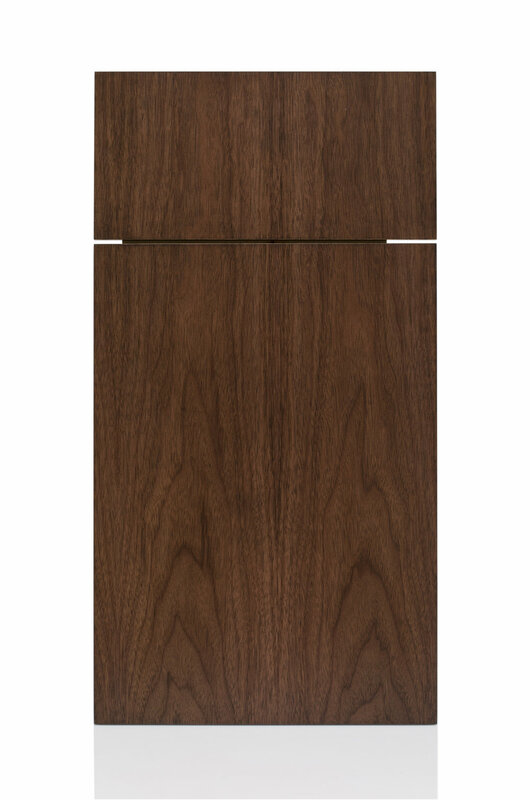 Walnut continues to make a big play in contemporary kitchens, and not just in ultra modern kitchens with slab doors. The Woodsman, named in honor of some of our favorite Portland gastropubs, celebrates the lumberjack-meets-nouveau-modern interior style we've been seeing more and more of. A blend of bold modernism and sophisticated style, this door wants to be paired with a white marble countertop and a dark tile floor. Punch up the modern with white subway tiles to the ceiling and open walnut shelves hung with black oxide Wallstirrups. A modern, grain forward door that looks great in a variety of modern kitchen settings. We tend to think of oak as the tired old stuff being peddled in big-box stores, and we brush it off without giving it a second thought. The oak you see commonly at home centers is flat sawn or, worse, rotary cut. But our oak is different. Rift sawn oak (white oak in this case) reveals a gorgeous grain that will cause you to rethink your assumptions about oak. With a natural finish this door can be the centerpiece of a modern kitchen. Available with vertical or horizontal grain. Sequencing is standard in both orientations. Equally gorgeous in Clear Vertical Grain Fir. A versatile, grain forward door that is often called a Shaker style, our Craftsman door is a modernist interpretation of a classic. It works well in a variety of kitchens from true Craftsman-style period kitchens to ultra modern "grain + stainless" kitchens. Fir was used extensively as a building material for homes in the western United States until about the 1920s. It was cheap and abundant. Less abundant now, Fir has a unique character that you can't find in any other wood. There's just nothing else like it. Clear Vertical Grain Fir is free of knots and showcases tight, vertical grain. 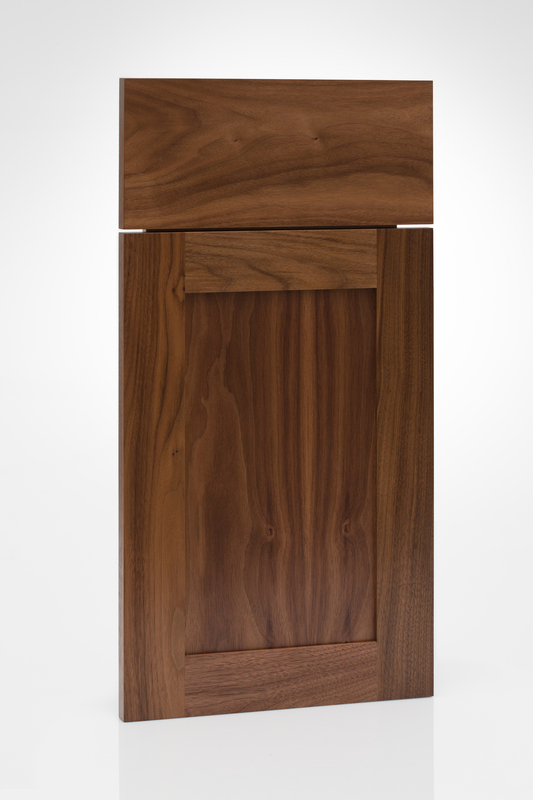 With a natural finish, the detail and character of CVG Fir stand on their own. Flat Sawn Walnut makes a dramatic impression that can easily be the star of a very modern kitchen. Walnut is making a huge play in modern kitchen design lately, and it's easy to see why. Combine it with high-gloss white accents and you've got something special that you'll go into your kitchen just to look at. Like to entertain? Your friends won't soon forget your Walnut kitchen. Looks fantastic in both vertical and horizontal grain orientations. Grain matching across cabinets (sequencing) is standard. Available in our standard Natural Finish or with a black glaze, an effect we call Black Walnut. Plain-sawn Alder with a glaze finish adds an air of upscale sophistication to any contemporary kitchen project. Alder is an ideal species for a glaze finish. There's enough grain to create visual interest, but not so much that it takes center stage. Adding a glaze mutes the grain even further, while providing some depth and complexity. In a kitchen, the effect is quite contemporary and feels a bit upscale. It's not loud, but it definitely says "style lives here." Sequencing (matching the grain across cabinets) is standard. A clear-finished Maple slab door is as utilitarian as it gets, but shoot...it looks good. The Laboratory doesn't scream "style" so much as it argues, factually, that utility is a virtue. Still, that utility offers a whole lot of style. The Laboratory evokes the no-nonsense cabinets found in high school science labs. Pair it with a black, inch-thick countertop and some Bunsen burners and the effect is complete.